We are delighted that OUP China-Hong Kong has been awarded a Certificate of the Good Employer Charter in recognition of fostering a good employer-employee relationship and culture. 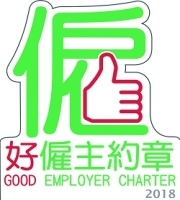 The Good Employer Charter is organized by the Workplace Consultation Promotion Division of the Labour Department of the Hong Kong Government. Its objective is to encourage employers to adopt progressive employee-oriented HR management practices, thereby cultivating a good people management culture in the workplace. To achieve accreditation employers are assessed on employee care, work-life balance, communication, and employee benefits.